Earlier this week I shared some DIY colorful Halloween treat bags, and today I have a fun DIY eyeball Halloween door cover idea to share with you! Earlier this year, Fiskars asked me to come up with a Halloween door cover idea using their awesome craft punches. As the parent of a preschool age kid and a toddler, I wanted to make something that would be an appropriate decoration for my own home and something that preschool and elementary school teachers could use to decorate their classroom doors – meaning it couldn’t be too scary. Enter this eyeball door cover inspired by classic Halloween googly eyes: a little bit creepy, a little bit silly, and a whole lot of fun to make! This door cover uses Fiskars circle punches in a variety of sizes, along with black and white card stock. It’s super easy to make, and tiny assistants will love helping you punch out the various eyeball circles. We also cut out a few favorite Halloween phrases from regular white printer paper to add to the door cover. The full how-to is available on the Fiskars website right here! I had such a blast putting this door cover together! The paper eyeballs seriously crack me up. 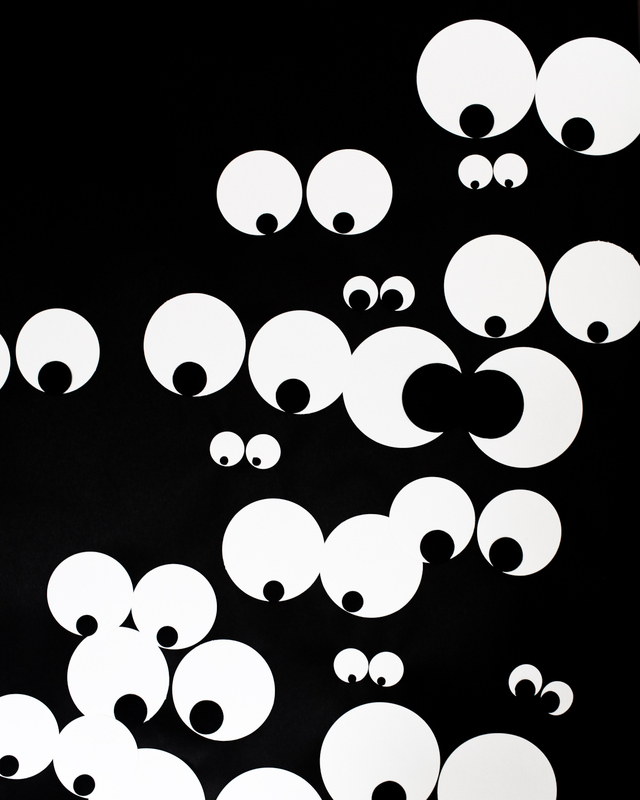 I just love the idea of 20+ pairs of eyeballs staring down at little trick-or-treaters! I wrapped my front door with a roll of black kraft paper and used a glue stick to adhere the eyeballs to the door, but you could skip the black paper and use non-damaging removable poster squares to put the eyeballs directly on your door. Add in some fake spiderwebs and a few Jack-o-lanterns and you have the perfect Halloween front stoop! Black and white eyeballs – perfect for Halloween! Check out the full post on the Fiskars website right here!